Pretty soon, watching video isn’t the only thing you’ll be able to do on your Roku set-top box. The company is announcing Wednesday that it will soon add support for casual games. Roku’s first partner in casual gaming is Rovio, which will bring its ultra-popular Angry Birds game to a new generation of its devices. The two companies have entered into a strategic partnership to sell the Angry Birds, Angry Birds Seasons and Angry Birds Rio video games through Roku devices. In addition, Rovio will launch an Angry Birds video channel that will include animated shorts, and the companies will sell Angry Birds merchandise through the Roku Channel Store. The sale of casual games and merchandise will help boost Roku’s potential revenues, as it will take a cut of all sales that happen on its platform. By striking a partnership with Rovio, Roku CEO Anthony Wood said it was following the same blueprint it took when it first launched its streaming video products. Roku came to market with Netflix (s NFLX) as its launch partner, which has helped it rapidly grow the number of customers over the last several years. Since the introduction of its Channel Store in 2009, Roku partners have developed more than 250 different entertainment channels, including video apps like Hulu Plus, Amazon Instant Video (s AMZN), Crackle (s SNE) and Revision3. The hardware maker hopes to replicate that success in the casual game sector. 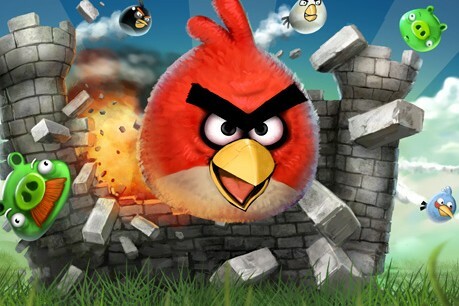 Although it will launch with Rovio, Roku is reaching out to other game developers to get them on board as well. It also has an open software development kit (SDK) that it is enhancing for casual game developers to create their own channels to run on the platform. But how will it work? Anyone who has used a Roku remote control or user interface recognizes the inherent limitations that come with the Roku platform. The up-down-left-right-select functionality on the remote control, while sufficient for navigating between channels and lists of content, for instance, is unlikely to get the job done with the precision necessary for launching birds from a slingshot at opposing pigs. Apparently the casual gaming channels will become available on new Roku devices, which will be launched this summer. New products could help accelerate the company’s growth, especially as it expands retail distribution. Roku announced at the end of 2010 that it had more than a million devices on the market, but that number is expected to grow dramatically. Driven by retail availability in stores like Best Buy (s BBY) and Fry’s, it has forecast more than 3 million devices in the market by year-end. Revenues are also expected to ramp up, from $47 million in 2010 to more than $150 million this year, according to Wood. Actually, the new games are NOT action games, they are puzzles & sudoku and mah jong, they use very little of the new 2d gaming system (they could have done almost the same games on the old system v.29, the only difference is the sound fx wouldn’t have been possible, and the graphics would have drawn a little bit slower. Also, even though the developer name on the new games is “Roku”, it is very possible that the developer is independent and just used the Roku name on their Dev account for lack of a better name. Given all the hype on the Angry birds thing (which, by the way Totally Rules on Roku2), I find it very hard to believe that Roku themselves would release games of their own that are not making full use of high-end graphics & sound. These games are not using much animation except for moving objects one square at a time (smooth movement is totally possible on the new system). Any idea when new games will be coming out? @Randy – There should be more coming by the end of the year, but Angry Birds was there for the big launch. So you will have get a new Roku to play games? I don’t know that I would get a new Roku just to play games. But I would possibly buy a Roku that does games and streaming, if it was priced right. The new 2D gaming features are built into the current 3.0 beta SDK, and will be released on the current hardware. Of course, it would be great if Roku releases some new remote-controller hardware, but in the short term, Android and iPhone roku remotes like DVPRemote (iphone app) could easily be modified to control a video game. Joel, thanks. True, mobile remotes could be modified to be used as controllers. But then, how do you watch both the TV and the touch screen at once? It’s like with a mouse-pad, you look at the screen while you move your fingers, although it would be cool to have some graphic action on the touch-screen too. Gaurav Mehta (developer of Soundgarage mobile for Android) and I did an android-roku hack at MusicHackDay SF last month using these new features to fling music tracks from SoundGarage on his Android phone to Musiclouds running on my roku, and Gaurav implemented graphic feedback to give the effect of actually throwing the music and having it play. There are all kinds of new features for AirPlay like behavior in the new SDK, most if it still early-beta stage at the moment, but tons of potential.